12/08/11 -- Corn: Sep 11 Corn closed at USD7.01 3/4, down 3/4 cen; Dec 11 Corn closed at USD7.14 1/2, up 1/2 cent. Despite the impetus of Thursday's bullish USDA report Sep corn only actually closed 8 3/4 cents higher on the week with Dec 11 1/2 cents firmer. Funds were said to have bought 3,000 contracts on the day making them net buyers of 12,000 on the week. Today's corn performance looks pretty disappointing for the bulls I'd say given the surprisingly bullish nature of the USDA numbers. Market direction from here will be dependant on the weather for the rest of the month but perhaps more importantly outside influences and money flows. Soybeans: Aug 11 Soybeans closed at USD13.37, up 3 1/4 cents; Nov 11 Soybeans closed at USD13.34 3/4, up 3 cents; Aug 11 Soybean Meal closed at USD348.60, up USD1.40; Aug 11 Soybean Oil closed at 54.60, up 57 points. Aug beans were up 5 1/2 cents on the week with Nov down 1/2 cent. As with corn, it's been a pretty uninspiring weekly performance given the bullish USDA numbers. 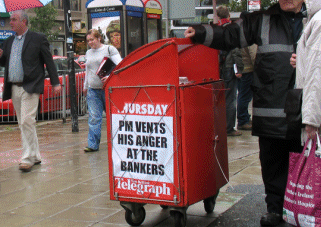 Global economic woes may dictate things next week. Data Friday reveals that US consumer confidence is running at it's lowest level since May of 1980. Wheat: Sep 11 CBOT Wheat closed at USD7.02 1/2, up 1 1/4 cents; Sep 11 KCBT Wheat closed at USD7.96, down 12 cents; Sep 11 MGEX Wheat closed at USD8.61 1/4, down 1 1/4 cents. On the week as a whole Chicago wheat rallied 23 1/2 cents, with Kansas up 15 3/4 cents and Minneapolis up 33 3/4 cents. The USDA numbers were least bullish for wheat, yet wheat was the strongest leg of the complex on the week. This maybe has more to do with the fact that the spec trade was short wheat going into Thursday's report so some short-covering likely took place prior to that. EU Grains Close - Corn Bull Or Wheat Bear? 12/08/11 -- EU grains finished with Nov London wheat unchanged at GBP163.25/tonne and Nov Paris wheat up EUR1.25/tonne to EUR198.75/tonne. On the week as a whole Nov London wheat gained GBP3.65/tonne. 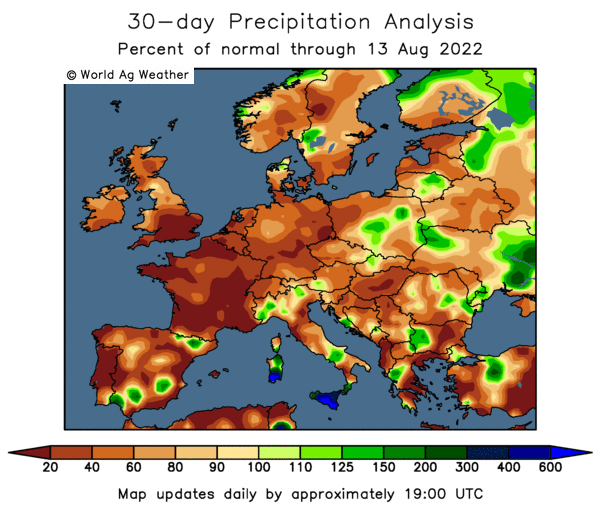 The USDA yesterday pretty much confirmed what has been pretty obvious for a while, the balance of wheat exporting power is switching away from the US and Europe and back to the Black Sea this season. On the face of it for wheat this was a pretty bearish report. Russian, Ukraine and Kazakh production were all raised from last month by a combined 7 MMT, far ouweighing the 800,000 MT reduction seen coming from the US. Export potential from the three major Black Sea nations was increased 5.5 MMT, seemingly at least partially the expense of US foreign sales which were reduced by 1.5 MMT from last month to 30 MMT, a 17% fall on 2010/11. EU exports were left unchanged from last month at 15 MMT, 33% down on 2010/11. French wheat production was raised 1.15 MMT from last month to 34.5 MMT, with UK output tweaked fractionally higher to 14.8 MMT and Germany's left unchanged at 22.2 MMT. World ending stocks in 2011/12 are now seen at close on 189 MMT, 6.7 MMT up on last month. Support for wheat has come from corn, particularly US corn, where production this year is now forecast at 328 MMT, 14 MMT down on last month. Even so that is 12 MMT more than in 2010 and the second largest US corn crop in history. Although world corn ending stocks were pegged only 1.1 MMT lower than last month at 114.5 MMT, it's US corn stocks that the market is fixated with. These are seen falling to 18 MMT and US stocks have only been lower than that once since the mid-1970's. World wheat stocks at the end of the 2011/12 season meanwhile are the second highest in the last ten years, and US stocks the third largest in the last ten. 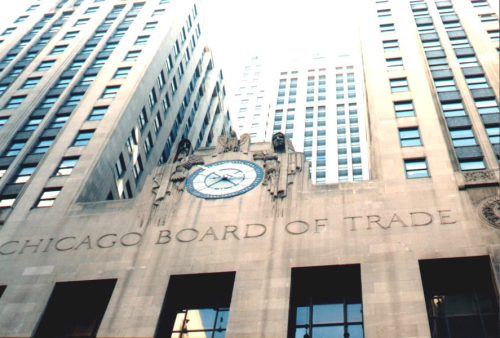 11/08/11 -- Soybeans: Aug 11 Soybeans closed at USD13.33 3/4, up 33 cents; Nov 11 Soybeans closed at USD13.31 3/4, up 30 1/4 cents; Aug 11 Soybean Meal closed at USD347.20, up USD8.10; Aug 11 Soybean Oil closed at 54.03, up 100 points. Funds bought an estimated 7,000 soybean contracts as the USDA lowered the 2011 US soybean yield by 2 bushels/acre, more than the 1.4bpa that the trade expected. That cuts production to 3.056 billion bushels, compared to the 3.174 billion that was anticipated. World stocks for 2011/12 were cut to 60.95 MMT on lower US production and increased world usage. Corn: Sep 11 Corn closed at USD7.02 1/2, up 24 1/2 cents; Dec 11 Corn closed at USD7.14, up 25 1/2 cents. Funds bought an estimated 15,000 contracts on the day as the USDA cut it's 2011 yield forecast by an aggressive 5.7 bushels/acre to 153bpa. It was the fact that they were prepared to confirm this sharply reduced yield potential rather than their normal style of chipping away slowly that surprised the market. Ending stocks for 2011/12 were cut from 870 million bushels last month to 714 million, compared to the 751 million the trade was anticipating. Wheat: Sep 11 CBOT Wheat closed at USD7.01 1/4, up 16 1/4 cents; Sep 11 KCBT Wheat closed at USD8.08, up 23 cents; Sep 11 MGEX Wheat closed at USD8.62 1/2, up 25 1/4 cents. US all wheat production was pegged marginally lower than the trade anticipated at 2.077 billion bushels (2.085 billion expected). Increases in production principally from Europe, Ukraine and Russia however saw projected 2011/12 world ending stocks rise by much more than anticipsted to 188.87 MMT. US exports were cut 1.5 MMT as Russia and Ukraine's were increased. Almost unnoticed were weekly export sales below forecast at 376,100 MT. 11/08/11 -- EU grains finished mostly firmer with Nov London wheat up GBP1.25/tonne to GBP163.25/tonne and Nov Paris wheat ending EUR2.50/tonne higher at EUR197.50/tonne. The USDA it's raised EU-27 wheat production estimate by less than expected to 133.5 MMT, 2.1 MMT down than last season. Output in both Russia and Ukraine was raised by 3 MMT each to 56 MMT and 21 MMT respectively as world production ws hiked almost 10 MMT from last month to 672 MMT. World consumption was raised 4.7 MMT to almost 675 MMT, with 2011/12 ending stocks increasing by 6.7 MMT to nearly 189 MMT. That total is now only 10 MMT shy of the so-called "burdensome" stocks levels of 2009/10 and the third highest in the past ten seasons. US wheat exports were cut 1.5 MMT to 30 MMT on the back of increased competition from the Black Sea where Russian exports were raised 4 MMT to 16 MMT and those of Ukraine upped 1.5 MMT to 9 MMT. EU-27 export potential was left unchanged at 15 MMT. Never one to disappoint though, the USDA provided their traditional surprise by cutting their US corn yield estimate by far more than the trade expected, by 5.7 bushels per acre to 153.0 bushels per acre. That lopped 14 MMT off US production this year causing corn prices in Chicago to jump around 25 cents despite the fact that a plethora of private estimates around the 153bpa mark were already in the market. Forecast production increases in the EU-27, Brazil and Ukraine combined with a projected fall in consumption actually only resulted in 2011/12 ending stocks falling a smidgen over 1 MMT. 10/08/11 -- Soybeans: Aug 11 Soybeans closed at USD13.00 3/4, up 2 cents; Nov 11 Soybeans closed at USD13.01 1/2, up 1 3/4 cents; Aug 11 Soybean Meal closed at USD339.10, up USD1.10; Aug 11 Soybean Oil closed at 53.03, unchanged. Beans ended with modest gains ahead of tomorrow's all important USDA numbers. Estimates for US ending stocks for 2010/11 are 218 million bushels and estimates for 2011/12 ending stocks are 168 million bushels. This season's crop is anticiapted being reduced on the back of yields falling from the 43.4bpa forecast last month to 42.8bpa this time round. That places estimated production at 3.187 billion bushels. Corn: Sep 11 Corn closed at USD6.78, down 1/4 cent; Dec 11 Corn closed at USD6.88 1/2, unchanged. Corn also showed little change, it seems that all the book-squaring ahead to the USDA reports had already been done. The trade is anticipating potential US corn production falling from 13.47 billion bushels last month to 13.08 billion this time round. It has to be noted however that it is entirely possible that the USDA will use the five year average corn yield and not what the trade estimates that this season's reduced potential really is. That could mean a significantly higher production estimate than the trade is expecting. Wheat: Sep 11 CBOT Wheat closed at USD6.85, up 13 1/4 cents; Sep 11 KCBT Wheat closed at USD7.85, up 22 cents; Sep 11 MGEX Wheat closed at USD8.37 1/4, up 20 1/2 cents. Short-covering ahead of tomorrow's USDA reports was probably behind wheat being the only commodity to put in anything like a significant rally. The trade is expecting only minor changes to US all wheat production. Global ending stocks for 2010/11 are estimated at 189.195 MMT, falling to 182.747 MMT in 2011/12. Potential increases in output and exports from Russia and Ukraine could see US shipments falling this season I feel. 10/08/11 -- EU grains finished higher with Nov London wheat up GBP1.30/tonne to GBP162.00/tonne and with May climbing GBP1.75/tonnne to GBP169.45/tonne. Nov Paris wheat was EUR1.50/tonne higher to EUR195.00/tonne whist May12 also rose EUR1.55/tonne to EUR198.75/tonne. The pound was down after the Bank of England lowered it's growth forecast for this year and also said that inflation could hit 5%, well above the target rate of 2%. 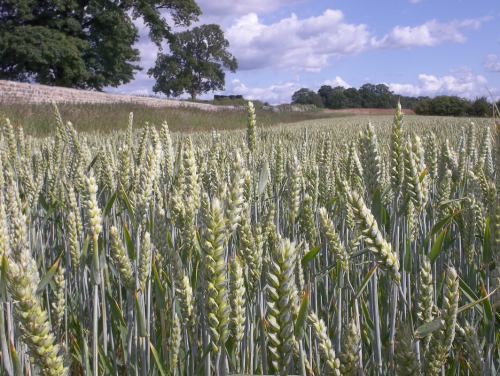 FranceAgriMer raised their French wheat production estimate by 1.3 MMT to 33.3 MMT, with yields upped to 6.6 MT/ha, aided by July rains. 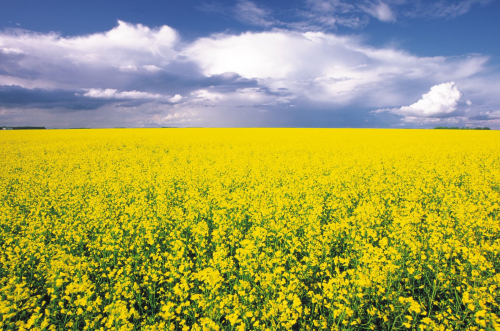 They also pegged the French rapeseed crop at 5.3 MMT, an increase of 10.4% on last year. 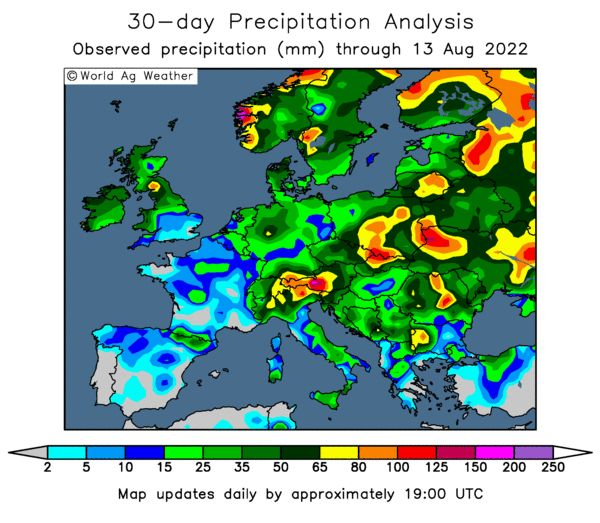 Wet weather continues to disrupt the harvest both at home and also in northern France, Germany and Poland. The USDA are out tomorrow with their August crop estimates and are expected to lower US wheat production a tad. I expect them to increase production and exports in both Russia and Ukraine whilst also lifting their output estimate for the EU. 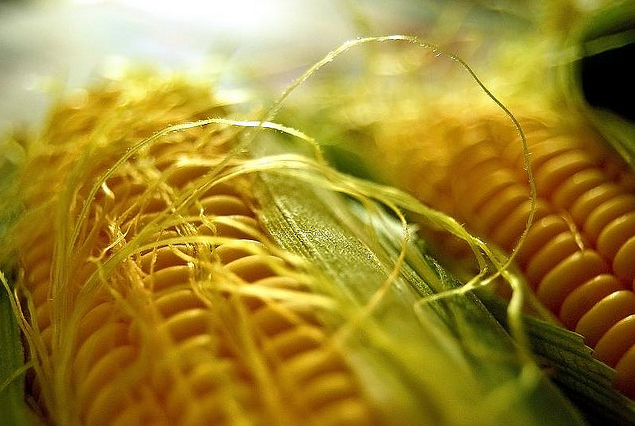 US corn production is seen being lowered after July heat damaged yield potential, but the USDA's capacity to spring a surprise should not be underestimated. 09/08/11 -- Soybeans: Aug 11 Soybeans closed at USD12.98 3/4, down 10 1/2 cents; Nov 11 Soybeans closed at USD12.99 3/4, down 11 3/4 cents; Aug 11 Soybean Meal closed at USD338.00, down USD2.10; Aug 11 Soybean Oil closed at 53.03, down 79 points. Crude and stocks rallied late in the day, but even that couldn't drag soybeans into positive territory. 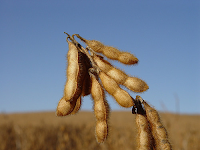 Funds were estimated to have sold 8,000 soybean lots on the day, offloading an additional 2,000 soymeal and 5,000 soyoil. The improved August weather outlook is seen potentially helping later-developing soybeans more than corn. Corn: Sep 11 Corn closed at USD6.78 1/4, up 3 cents; Dec 11 Corn closed at USD6.88 1/2, up 2 1/2 cents. Funds were said to have been net buyers of 10,000 contracts on the day. Recent volatility on corn saw the CFTC increasing the daily limit on corn futures to 40 cents as of August 22nd. The trade is positioning ahead of Thursday's USDA reports where 2011 US corn production is pegged at 13.082 billion bushels according to the average trade guess, versus 13,47 billion from the USDA last month. Wheat: Sep 11 CBOT Wheat closed atUSD$6.71 3/4, up 15 1/4 cents; Sep 11 KCBT Wheat closed at USD7.63, up 7 3/4 cents; Sep 11 MGEX Wheat closed atUSD$8.16 3/4, up 11 1/2 cents. Funds were said to have bought 5,000 Chicago contracts on the day. Thursday's USDA report is seen cutting US all wheat production fractionally to 2.08 billion bsuhels. Trade estimates for the 2011/12 ending stocks range from 578 to 762 million bushels with an average guess of 671 million. 09/08/11 -- EU grains finished higher with Nov London wheat up GBP3.45/tonne to GBP160.70/tonne and with Nov Paris wheat up EUR3.25/tonne at EUR192.50/tonne. It was another turnaround Tuesday with wheat both sides of the Channel rebounding from recent significant losses. Clearly the plea for calm from those bastions of morality Messrs Rooney and Ferdinand were sufficient to calm the markets. 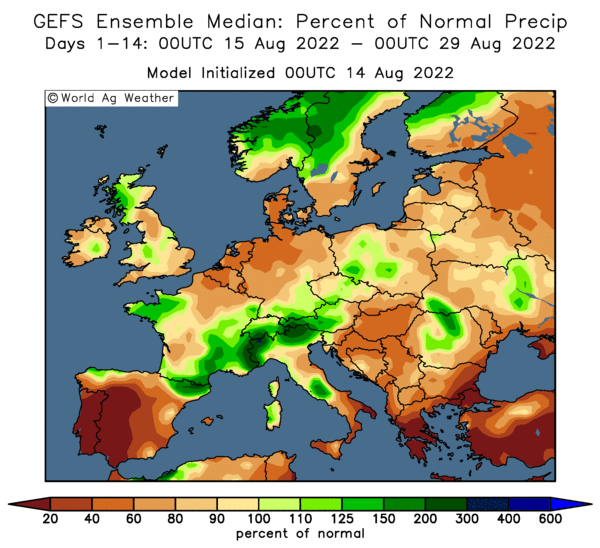 European crop concerns centre on Germany for the second year in succession as rains there threaten another wholesale crop downgrade. Further unwanted precipitation is in the forecast for the rest of the week. Strength was garnered from firmer world stock markets after several days of declines. A little book squaring ahead of Thursday's USDA reports was also a factor. Still, fears over European and US debt are never going to be far away. This was duly highlighted after the close of play when the Federal Reserve's latest monthly statement, highlighted the US central bank's limited powers to halt the shakedown, according to Agrimoney.com. 08/08/11 -- Soybeans: November soybeans fell 24 1/3 cents to USD13.11 1/2 a bushel. December soymeal slid USD6.00 to USD346.50 whilst Dec soyoil dropped 111 points to 54.44. Funds sold an estimated 6,000 bean contracts in the wake of overnight weakness tied to the S&P's downgrade in America's credit rating. After the close the USDA raised good/excellent crop conditions one point to 61%, the trade was anticipating a 1% drop. Corn: Sep 11 corn closed at USD6.75 1/4 cents, down 17 3/4 cent; Dec 11 corn closed at USD6.86, down 17 cents. Funds sold an estimated 13,000 contracts today as money flooded out of risky assets such as grains. Crude oil fell heavily and the Dow ended 500 points lower, adding to cron's woes. After the close the USDA pegged the percentage of the crop rated good/excellent at 60%, two points down on last week. The USDA reported 120 TMT corn sold to Egypt for 2010/11. The US weather outlook is fairly benign for August. The question now is how much irreversible damage was done in July. Wheat: CBOT September wheat fell 22 1/2c to USD6.56 1/2 a bushel; KCBT September lost 25c to USD7.55 1/4; MGEX September dropped 22 1/4c to USD8.05 1/4. 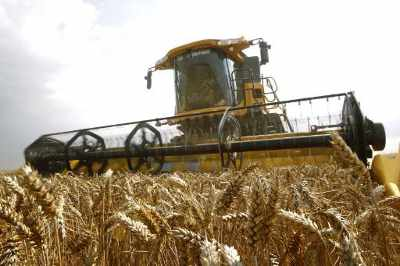 Funds were said to have sold an estimated 5,000 CBOT wheat contracts on the day as world economic uncertainties crept into the market. After the close the USDA said that winter wheat harvesting is 85% done, versus 91% normally. 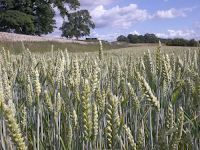 Spring wheat crop ratings fell four points to 66% good/excellent. They also reported HRW wheat sold to unknown this afternoon. 08/08/11 -- EU grains finished with Nov London wheat down GBP2.40/tonne to GBP157.25/tonne and Nov Paris wheat EUR5.25/tonne lower at EUR190.25/tonne. The global meltdown in commodities and stocks continued into the start of the new week, spurred on by the downgrade to America's credit rating by S&P's. they've also cut their rating on US mortgage giants Fannie Mae and Freddie Mac. At the close of play the FTSE100 was 178 points lower, or down 3.4%, the lowest close in more than a year and also the first time in history it has shed more than 100 points in four successive sessions. Believe it or not that wasn't a bad performance compared to other European stock exchanges, the German DAX fell 5%, with the Paris CAC not too far behind either. All of this is keeping the grain markets extremely nervous, a London wheat front month has only closed lower than this once in the last ten months. Paris rapeseed didn't escape the carnage, ending EUR14.00/tonne lower on nearby Nov, down 3.3% on the day. 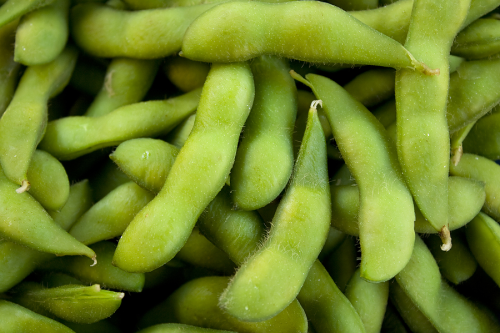 The USDA are out on Thursday with their August world supply and demand numbers. 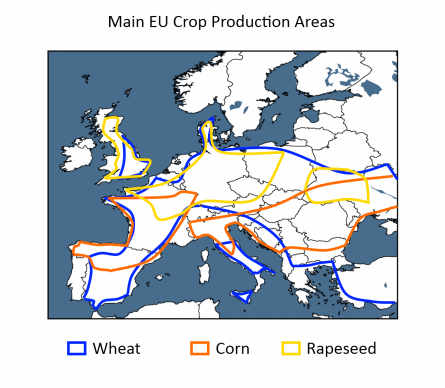 Increases in wheat production estimates are anticipated for the EU, Russia and Ukraine. 08/08/11 -- The overnight grains were lower across the board in part of a general commodity/stocks sell-off based on S&P's US credit rating downgrade late Friday. Beans closed the Globex session 16-19 cents lower, with corn around 13 cents easier and wheat falling 18-20 cents. Crude oil is 3 cents away from being USD4/barrel lower as I type. European grains are sharply lower too with Paris wheat and corn down around EUR5.00/tonne and rapeseed declining more than EUR10.00/tonne. The ECB have been busy buying Italian and Spanish bonds in an attempt to assure the market that it has a plan, even if it only thought of it over the weekend. The stock markets aren't hugely convinced with the FSTE100, CAC40 and DAX all down around 2.5-3.0% today. The US weather outlook is fairly benign for August. The question now is how much irreversible damage was done in July. There are plenty that think that the answer to that one is "shitloads actually" - we will have to wait and see. If they are right, then we appear to be developing into a tug-of-war between grain fundamentals and wider global economic woes. If they are wrong the we really are in for a bear market. The USDA are out with their box of tricks Thursday, my head tells me that they will be higher than the trade has factored in on US corn yields. It's their almost unerring capacity for a shock that has me scratching my head, pondering if they will come up with something outrageously bullish instead. Again we will have to wait and see. A bearish set of numbers (ie hardly changed from last months yield of 158.7bpa) would probably be quickly dismissed as the USDA talking rubbish again. That is if it wasn't for this overtly large set of outside bearish influences kicking around at the moment. Corn prices HAVE to go up, that's what the frustrated bulls are screaming. We need to ration demand, we've only got fifteen minutes of carryover stocks left, the stuff is dying in the fields etc, etc. That's what they're saying. The thing is, the way things seem to be going, the world won't use appreciably more corn if the price was USD5/bushel so long as everything else moves down within the same parameters - as they likely would. Neither would the world use significantly less if it was USD10/bushel either, with the rules of the game as they stand at the moment and with other raw materials increasing by a similar amount. The two most important factors in deciding market direction right now, in my opinion, are the same as they have been for the last five years or so: a) the inclination of spec money to either stick with or exit the market. b) who has the grain to sell, is it the cheap shops or is it Harvey Nicks? We already know the answer to the second one. If that was to combine with an "I want out" response from the "smart money" to the first then the market is going lower. If the USDA throw a bearish hat into the ring Thursday as well then who knows how much lower? Especially as a significant move to the downside now would trigger some weighty stop-loss selling from the non-believing bulls. The USDA have announce the sale of 120,000 MT of corn to Egypt and 100,000 MT of HRW wheat sold to unknown this afternoon. Early calls: beans 15-20c lower, wheat 18-20c lower, corn 12-15c lower. 08/08/11 -- America's credit rating cut late Friday has triggered further broad-based selling in commodities and equities in the Far East this morning. Crude oil is down more than USD3.00/barrel at 8am London time, that's a 12.7% decline since the end of July. Asian stock markets continued their decline with Hong Kong's Hang Seng falling 3.5% this morning. Gold meanwhile is at a new record high approaching USD1,700/oz, as investors are stuck for ideas as to where exactly is a good place to put their money. The normal safe haven of the dollar doesn't look quite so reliable any more, with the pound rising to 1.6450 against the greenback. The overnight Globex grains are under pressure too, with soybeans down 12-14 cents, corn falling 6-7 cents and wheat 7-9 cents weaker. The weekend saw a significant amount of rain fall with 50% coverage over large parts of the Midwest, say WxRisk weather. We have to look beyond the 6-10 day forecast to the 11-15 day range to see any real heat on the horizon, but even that far forward it's only the Lower Plains and Deep South that look at risk, they add. Besides keeping an eye on developments in the US and with regards to the European debt crisis too, we also have the not insignificant matter of the USDA reporting on US and world crop production, consumption and stocks later in the week. By now I doubt if anybody underestimates the USDA's capacity to spring a surprise here, indeed it almost seems that they're expected to do it as a matter of routine. I'll be keeping an eye on things from my sun lounger by the pool in Portugal across the next two weeks, and will at least be attempting to update my comments on the EU and CBOT grains closes every night. Good luck with the harvest weather in dear old Blighty. TTFN. 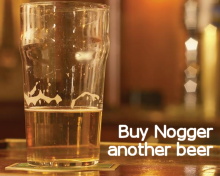 Nogger.